ORDERS from on high can shape the Chinese economy. In 2013 Xi Jinping, the president, said cities should be more like sponges, sopping up rainwater for reuse when parched. China is now working on some 30 “sponge cities”. Then in 2014 Mr Xi said the government should encourage businesses to invest in state projects. Since then China has announced plans for thousands of “public-private partnerships” (PPP), including sponge cities. But investors do not seem interested. 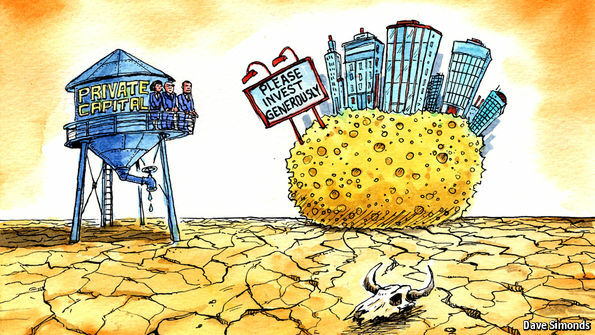 Sponge cities are struggling to soak up private capital. This month Guyuan, a city in Ningxia, a north-western region that is dry most of the year, launched China’s first sponge-city PPP. However, as is the case with others that are in the works, the “private” side of the partnership was not all it was cracked up to be. The investor, Beijing Capital, is in fact a government-owned firm. And to make the deal viable, the government pitched in a subsidy worth nearly one-fifth of the 5 billion yuan ($750m) total cost. 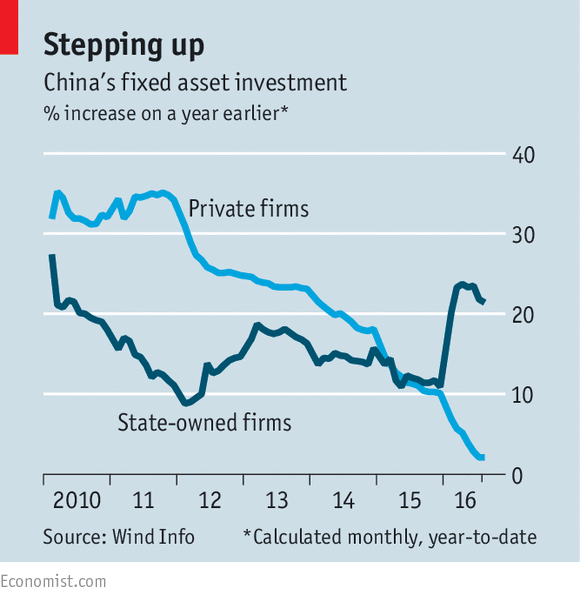 This points to a bigger problem: a sharp slowdown in private investment in China. New data on September 13th underlined the trend. Over the first eight months of 2016, private-sector investment rose by just 2.1% from the same period a year earlier, virtually the lowest rise since records began in 2005. Meanwhile state-backed investment has soared (see chart). It might seem unsurprising that the government is driving China’s economy. But it marks a big shift: the private sector was responsible for roughly two-thirds of investment over the past decade. And since investment accounts for nearly half of GDP, private caution clouds the growth outlook. The simplest explanation for the slowdown is that the state has crowded out the private sector. Government-backed entities have long had better access to banks. In the past private companies have compensated by using their own earnings and tapping shadow lenders. Both routes are harder this year. Profits are not growing at the heady double-digit rates of not long ago. At the same time regulators have curbed shadow banks, leery of the risks brewing inside them. A side-effect has been to deprive some private firms of financing. Yet that is only part of the problem. Many companies have money but are not spending it, says Zhu Haibin of JPMorgan Chase. They are keenly aware of the overcapacity in industries from coal mining to solar-panel making. Returns on capital have fallen by a third since 2011 to about 7%, according to Société Générale. With average bank lending rates just a touch lower at 5.25%, many are holding back, hoping profitability will improve. State firms can afford to pay less attention to the bottom line. Despite weaker returns than their private peers, they have kept investing. The politics of big infrastructure projects are also a stumbling block. Local governments are reluctant to cede their most promising projects to private investors. Many officials are suspicious of private firms. Beijing municipality recently signed a PPP agreement for a new highway, and picked China Railway Construction Corp, a mammoth state-owned enterprise, as its partner. The official in charge suggested that private companies had neither the ability nor the capital necessary. And with ventures such as the sponge cities, it is not clear to private investors how they will make returns. Unlike toll roads or power stations—normal fodder for PPP deals—better drains and reservoirs are not easily converted into profits. This being China, there are, as ever, questions about the quality of the data on investment. Some economists believe the public-private gap is exaggerated because of the government’s stockmarket rescue last summer, when the state acquired bigger stakes in companies. As these ownership changes filter into the data, they may be adding to the apparent increase in state investment. Separately, catastrophic numbers from Liaoning, a north-eastern province, have wreaked havoc with national statistics this year. Investment there is down by nearly 60%, but this may largely reflect a clean-up of previously embellished figures, not an economic disaster. The government itself, however, is certainly behaving as if the problem is more than a statistical accident. This summer it dispatched teams of inspectors to 18 of China’s 31 provinces to see why private companies were not investing. Earlier this month the cabinet unveiled measures to encourage them to spend more. It promised to treat private firms the same as public ones when investing in sectors such as health and education. It called on banks to lend more to them. And it said it would roll out more PPP projects, enticing private investors with larger state subsidies. These pledges may well show some results in the coming months, especially now that the government is talking so openly about the need to spur private investment. But many economists say that bigger changes are needed. To begin with, China could make it easier for private businesses to invest in state-controlled sectors such as finance and transportation. The government could also break up some of the state-owned enterprises that currently dominate these sectors. For the time being, though, it is moving in the opposite direction, merging state firms to create even bigger national champions. The silver lining in all this is in what it says about the acumen of China’s private investors. Their caution reveals how big a role market forces, as opposed to top-down orders, now play. The government would love to see companies open their wallets. Instead, they are behaving like sensible businesses anywhere. They are conserving their cash and waiting for better opportunities than sponge cities to emerge. - The market is materially mispricing the strength of the US consumer whose weakness will lead the US economy into a recession in Q1 2017. - The deterioration of lower and middle income consumers indicates that the top is next to roll. - The Federal Reserve has its hands tied, which will lead to lower yields and a bid for gold. The market is materially mispricing the strength of the US consumer whose weakness will lead the US economy into a recession in Q1 2017. The divergence is a result of the top 40% of earners who have accrued 84% of all new income and only 34% of new debt since 2013. This strength has driven headline sales figures and accounted for nearly all deleveraging since the financial crisis. That said, the market has extrapolated the health of top 40% to all consumers, as it corresponds to the current narrative of low unemployment and rising average hourly earnings leading to higher rates of consumption and balance sheet strength. Due to this misconception, we believe the market has overlooked the deterioration of lower and middle income households who have historically preceded the fall of the top. We see this disparity being corrected over the next 6-9 months, as a series of disappointing retail sales and consumption figures lead market participants to the realization that their thesis is imperfect. This will drive yields lower and handcuff the Federal Reserve, which we see as a very supportive backdrop for gold (NYSEARCA:GLD). We outline this thesis below. 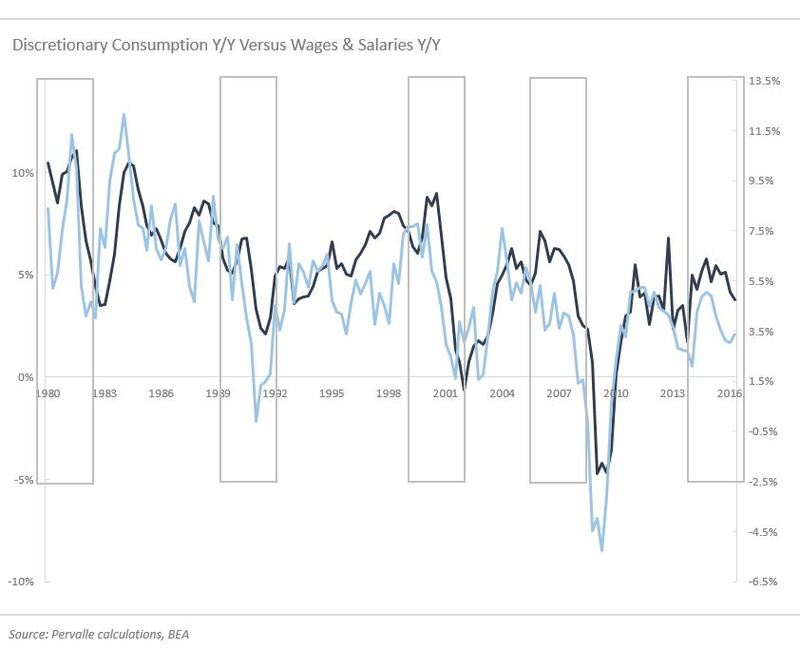 The consumer bull thesis has been predicated on robust job growth and declining unemployment leading to higher wages, in turn driving consumption and GDP. We believe this premise is false, as it fails to correspond to the facts. For example, since 1980, when the unemployment rate was at or below 5.1% (currently 4.9%), nominal GDP averaged 5.35% and average hourly earnings (AHE) grew at 4.4% y/y. Over the trailing twelve months (TTM), we have seen nominal GDP print 2.87% and AHE growth of 2.3%, which is a 46% and 48% discount to historical precedents. This is also the case for discretionary consumption, which over the TTM grew at a 42% discount (3.7%) to its historical average of 6.42%. While we would expect growth rates to come down over time from a higher base, we believe the current spreads indicate that the unemployment rate is not an accurate reflection of the labor market, which is due to those that have left the labor force. 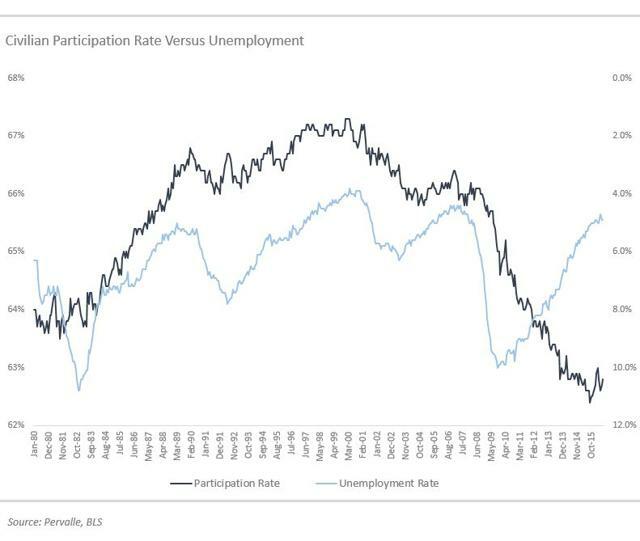 Below we have charted the civilian participation rate versus the unemployment rate (inverse) from 1980 to present. As you can see, there has historically been a strong relationship between the two, as a robust labor market incentivized side-lined workers to enter the labor force due to attractive income prospects. This correlation broke, however, following the financial crisis, which we believe is an indication that the decline in unemployment has been a result of those leaving the labor force, rather than material net job gains. We can illustrate this by the disparity between current AHE and unemployment versus historical precedents. For example, with data going back to 1965, we can see that an AHE growth rate less than or equal to 2.5% has historically corresponded to an unemployment rate of 6.9%. This is also in line with discretionary consumption, which is indicating the rate is slightly higher at 7.2-8%. While consumer bulls claim the divergence is a result of baby boomers leaving the workforce, we would point out that the participation rate for those 55 and older is near the highest level since 1970, while the primary working population, or those between 25-54, has declined to levels last seen in 1986. Given the data, it is hard to justify the current narrative that a tight labor market will lead to higher AHE and thus consumption. 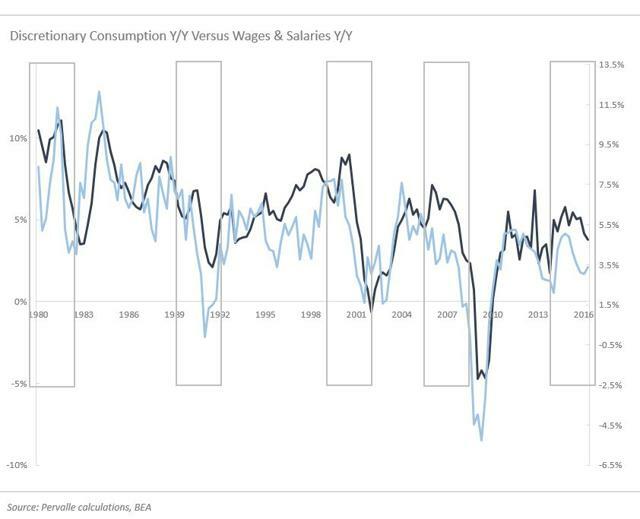 That said, even if wage growth did happen to manifest, the consumer bull thesis would still be inaccurate, as AHE of production and nonsupervisory employees have had a -13% correlation with retail sales since 1993. If we use AHE of all employees introduced in 2007, we see the correlation is even stronger at -65%, suggesting that rising AHE hinder consumption growth. To us, the lack of correlation makes sense, as the bottom 60% of earners represent 35% of total consumption, and are primarily paid on an hourly basis, so their rising earnings fail to have a material impact on headline figures. 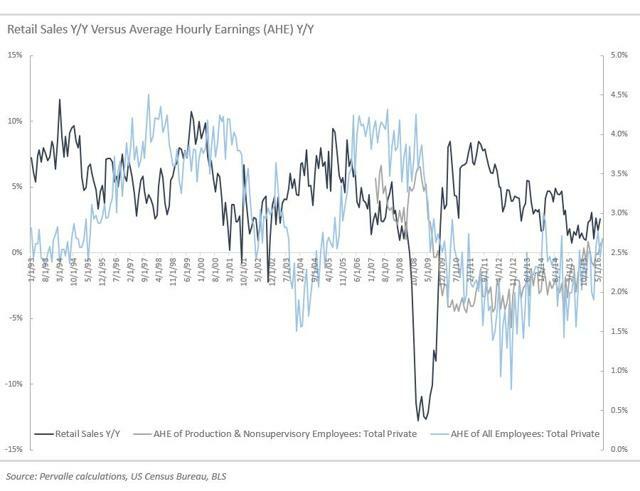 The market's misconception of both the unemployment rate and change in average hourly earnings is a direct result of the top 20-40% of earners, as their strength has provided supportive data that corresponds to the current narrative and headline figures. For example, since 2013, the top 40% of earners have accounted for 84% of all new income and only 34% of new debt. 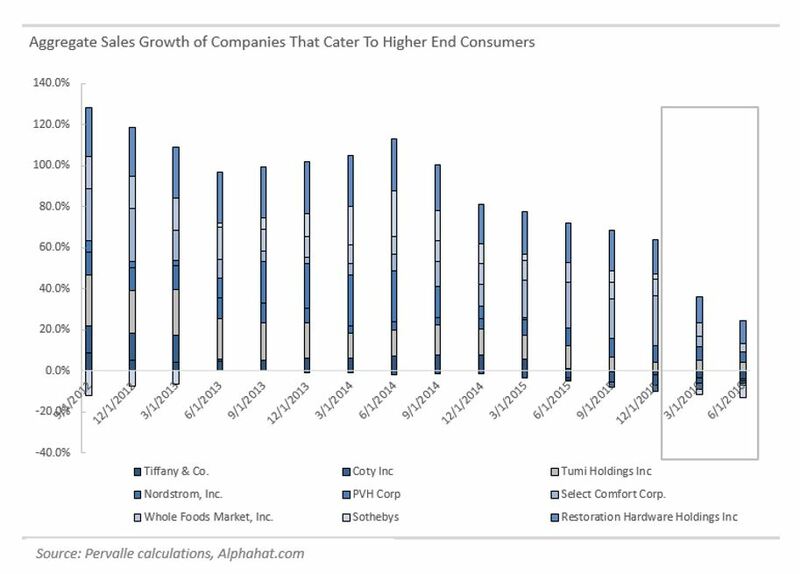 This has led to a material reduction in aggregate leverage relative to income and provided a consistent bid to retail sales, as this cohort represents 65% of total consumption. 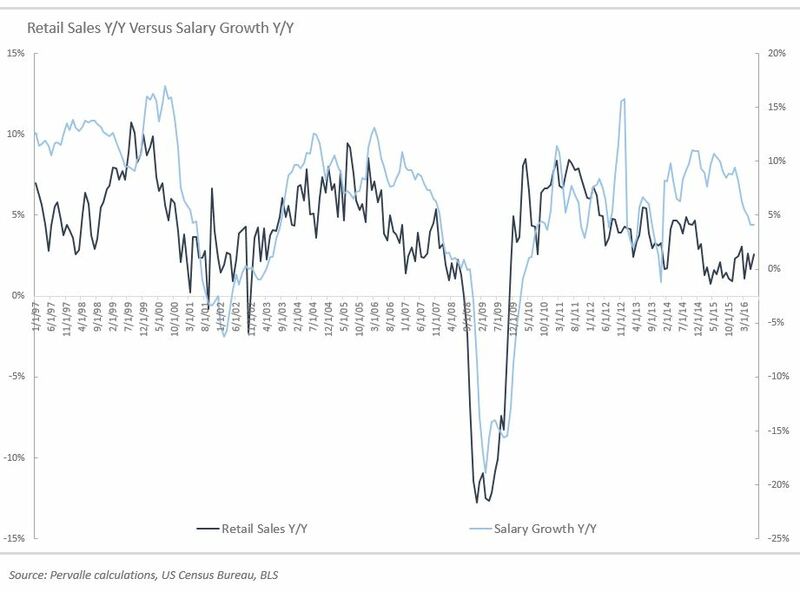 It is this strength that is showing up in headline figures, which we can illustrate by the 70% correlation between salaries and retail sales y/y, as salaries typically correspond to the top 40% of earners, shown below. That said, market participants have overlaid the strength of the top end consumer onto misleading headline figures, such as the unemployment rate and AHE, which therefore paints a picture of broad based consumer strength. This has masked the deterioration of lower and middle income households who have seen both costs and debt rise at a faster rate than income, which has historically preceded the fall of the top. 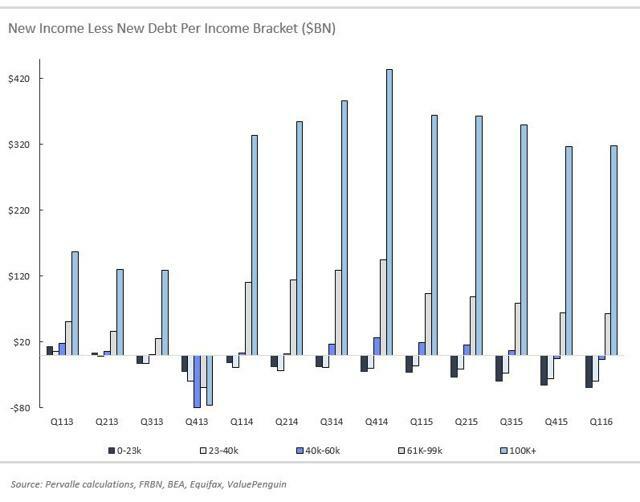 Since 2013, the bottom 60% of earners have accrued 66% ($1.538T) of all new debt, while only seeing 16.2% of total new income, as artificially suppressed interest rates and loose lending standards led consumers to materially expand leverage. While this cohort's balance sheet (BS) has deteriorated, the aggregate BS still remains healthy due to the strength of the top 40% and the overall decline in mortgage balances. Since the financial crisis, mortgage balances have accounted for 100% of the reduction in balance sheet leverage, as originators tightened lending standards and consumers defaulted on loans. This forced those who were unable to secure a mortgage to rent, which has pushed rental vacancies to the lowest level since 1985 and driven rents as a percentage of median income to a historical high of 30%. Because of this dynamic, a material portion of leverage that previously would have been associated with housing has moved 'off balance sheet' per se in the form of rent expense. So while the cost of housing still remains, total leverage has declined materially, and when combined with the income gains of the top 40%, it provides an illusion of broad based consumer strength. That said, the accumulation of consumer debt by the bottom 60% has been distressing, as ~70% of all new student debt ($805B), 56% of new credit card debt ($88B), and 59% of new auto debt ($680B) now resides on their balance sheets. Referring to the chart below, we can see that the bottom 40% of earners began expanding debt at a faster rate than income in Q3 2013, with the 40-60 bracket joining towards the back half of 2015. This rate has progressively accelerated into the most recent quarter, which to us is an indication that lower and middle income households are currently stressed and underwater. Historically, declining consumer breadth has preceded high end weakness, which is being confirmed by consumer margins. Consumers, like businesses, retain a percentage of earned capital after deducting expenses, which can be used to expand consumption, repay debt, or be saved. Given data from the Bureau of Economic analysis, we have created a consumer income statement by taking personal income and netting out core expenses from personal consumption expenditures (PCE). This gives us an understanding of discretionary cash flow and provides a referenceable proxy for consumer health. Since 1971, consumer margins have fallen from 57.5% of personal income to 41.1%, primarily from increases in health care and financial services/insurance, as they have accounted for 77% of the total dilution [60% HC, 17% FS/I]. This has led to a reduction in discretionary cash flow, which in turn has reduced the rate of discretionary consumption from 10%+ to 3.5%, as shown below. 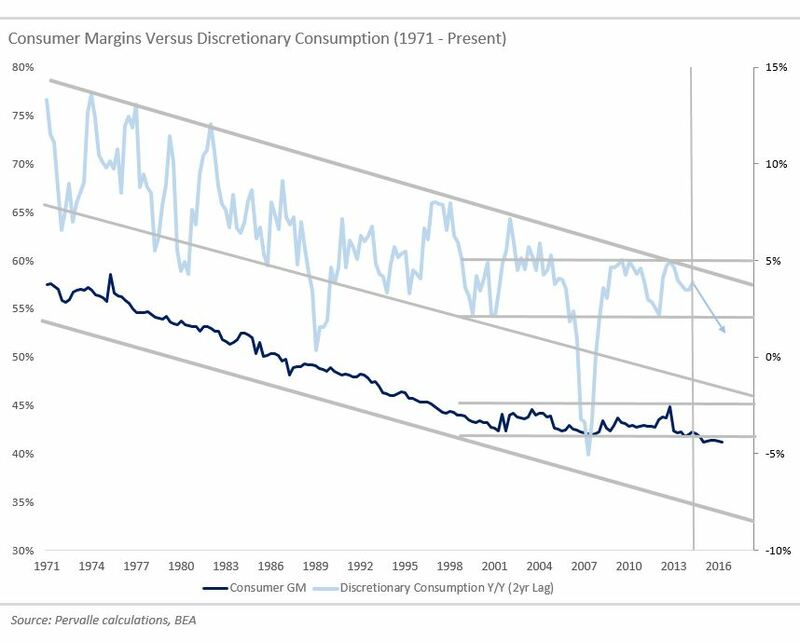 While margins have historically been a directional indicator, we have found that over the past 20 years, they have been a leading indicator of discretionary consumption. This is likely due to the incremental change in margin having a greater effect on discretionary cash flow, as it now represents a much larger portion of the consumer's aggregate income relative to history. 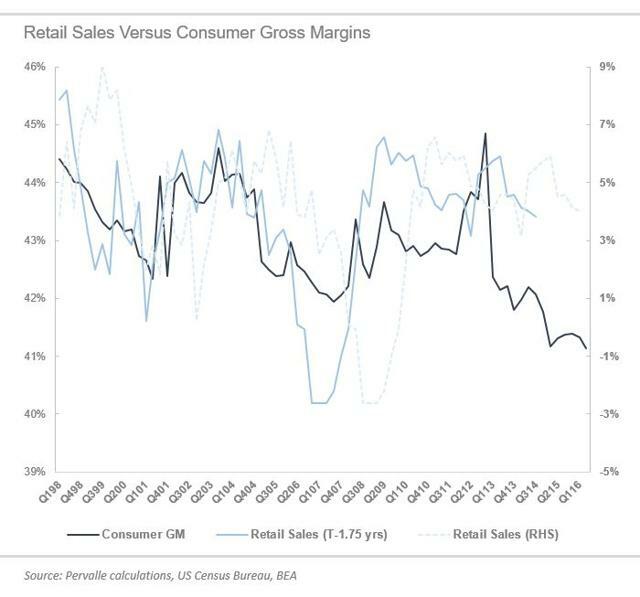 Over the past 20 years, we can see that consumer margins have led retail sales by 1.75-2 years, as illustrated below. The lag is primarily due to consumers financing margin dilution with balance sheet liquidity and credit. This is to say that as consumers make less per dollar, they either finance higher costs or maintain the same level of spend through the use of their credit card or cash on hand. The balance sheet then holds that stress until it is unwound later in the cycle, as it is repaired. Lower income households are first to feel this stress, as they are disproportionately affected by rising costs. For example, in Q1 2016, health care costs rose $118B y/y, while total new income rose $612B. Of the $612B, 62% or $379B accrued to the top 20%, but 62% of the $118B was not proportionately allocated to the top 20%, as health care costs are principally based on age, location, and use of tobacco. This results in a disproportionate cost allocation to lower income consumers, who in turn see costs rise at a higher clip than income. 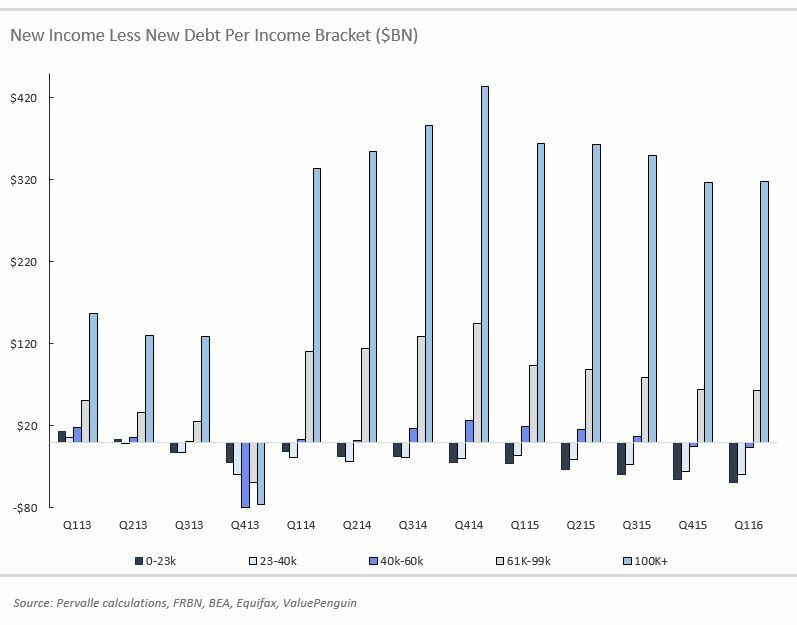 Referring to the net debt per income bracket chart above, we see that the lowest income brackets began expanding credit at a higher rate than income in relation to the 2013 turn in margins. As costs trended, this rate increased, reflecting the use of revolving credit to finance consumption or expenses. 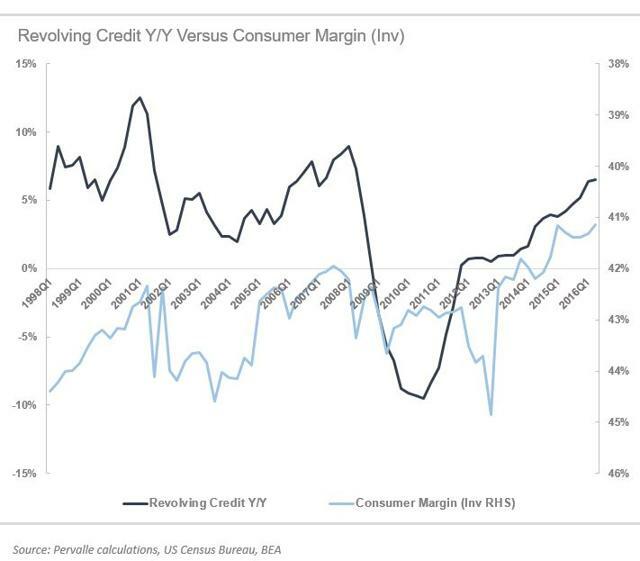 We can see this below by the inverse relationship between the consumer's margin and revolving credit y/y. This is to say that as margins fall, consumers expand credit, and as margins rise, consumers pay down outstanding balances from the incremental margin dollar tailwind. 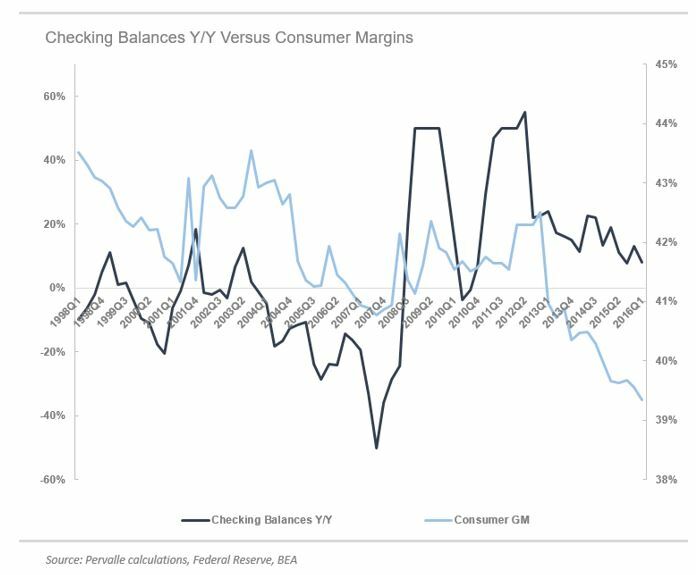 Consumers also finance the expense/consumption gap with balance sheet liquidity, as shown below by the relationship between checking balances y/y and consumer gross margins. Checking balances are the primary source of liquidity for most lower and middle income consumers, as savings accounts are predominantly held by those at the top [Google consumer survey] who are not affected to the same degree from rising costs. Throughout the margin cycle, the incremental consumer sees his/her liquidity dry up, which leads to a reduction in consumption, as income is then used to 'destress' his/her balance sheet. As margins trend lower, the number of stressed consumers grows to a point where spending cuts outweigh the incremental benefit from the top. Empirically, this is represented by the divergence between wage and salary growth and retail sales y/y (below), which has historically marked the end of the cycle, leading to a reduction in consumption from the top 40%. We saw this divergence in Q3 2015, and thus far, personal income and top end strength both have followed suit. 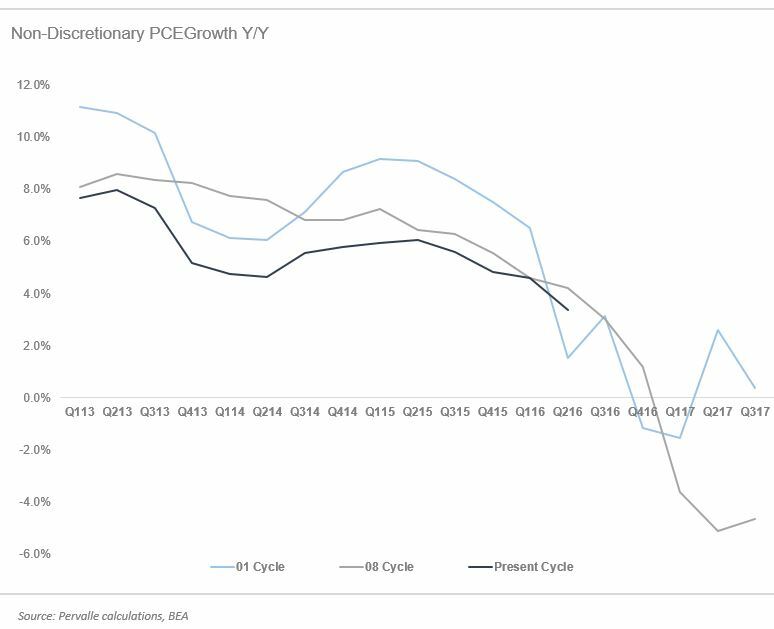 Referring to our high-end consumer proxy, we can see there has recently been notable weakness, as aggregate sales growth has fallen off 24.8% and 5.1% in Q1 2016 and Q2 2016 q/q. These declines are consistent with end of the cycle behavior, as the top is the last to roll. 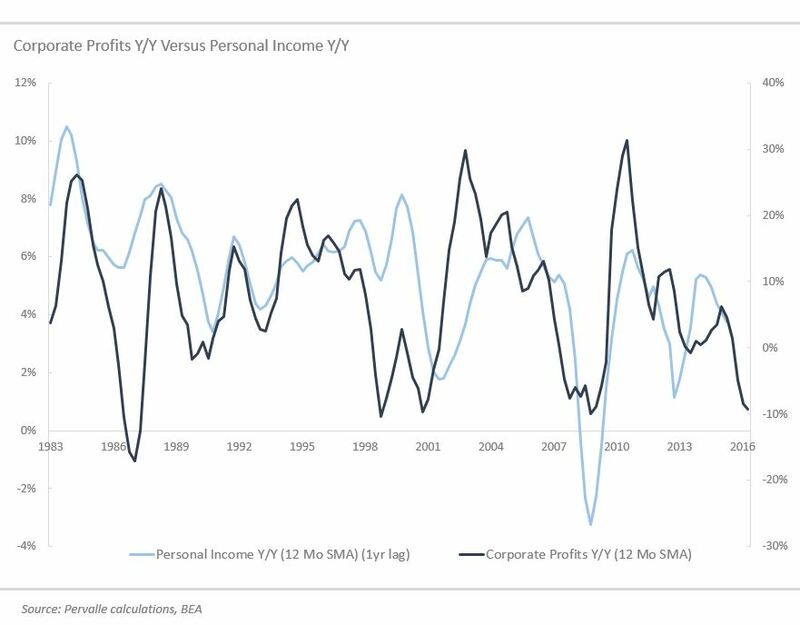 Corporate profits also indicate that we should see further declines in top end consumption, as they have historically been the strongest leading indicator of personal income growth, which primarily corresponds to the top 40% of consumers. 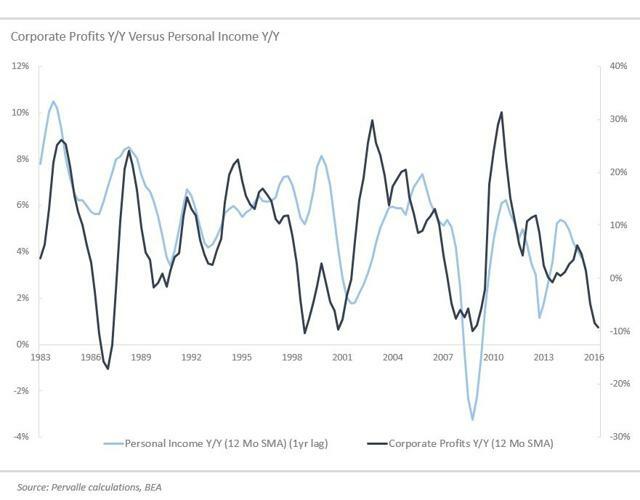 Since 1983, corporate profits have rolled 4 quarters before personal income, suggesting PI will decline materially over the next year, in turn putting material pressure on discretionary consumption growth. 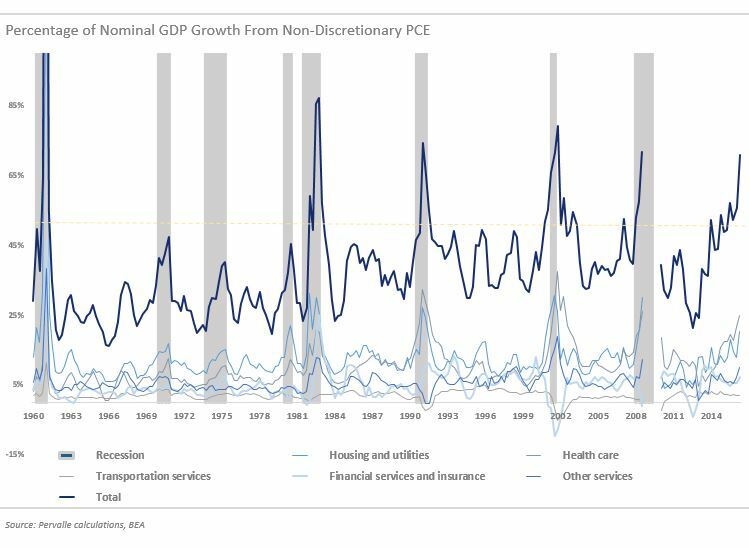 In addition, we are seeing late cycle indications from non-discretionary PCE, as its current percentage of GDP growth has historically been associated with a recession. Over the next 9 months, we see discretionary consumption slowing materially [31% of GDP and our proxy for retail sales] from declining personal income growth and low-to-mid end consumer deleveraging. 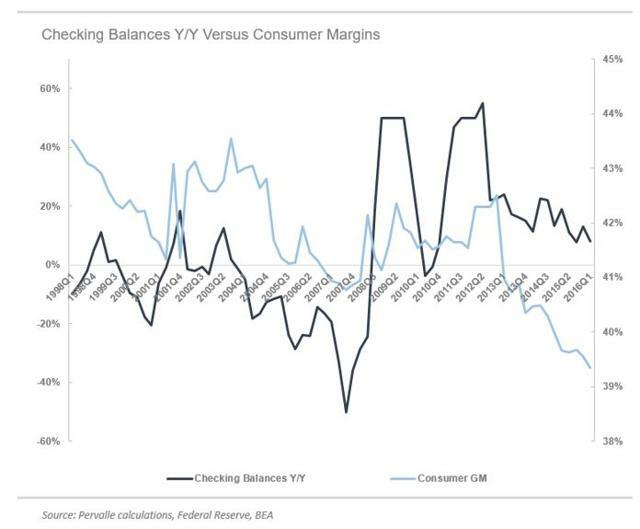 As noted previously, consumers reduce consumption to repair balance sheet stress as margins rise. This has already begun as the current margin cycle of 4-4.5 years has bottomed, which we can see is in line with the two past cycles on both an absolute and relative basis, shown below. 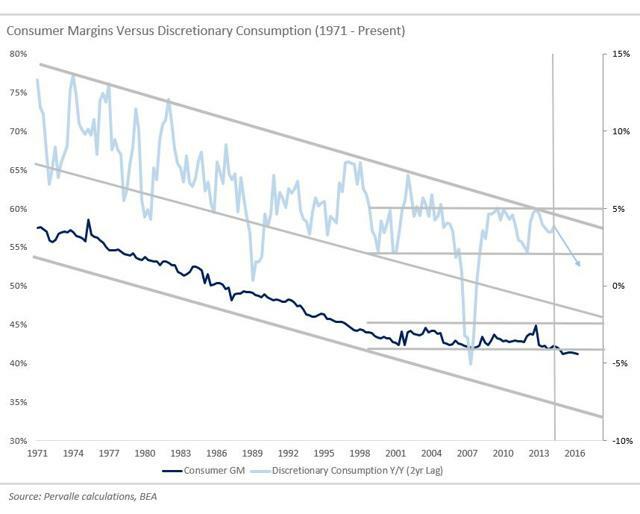 For consumer margins to rise going forward, non-discretionary items will need to fall at a faster clip than personal income. This is very ominous for economic growth, as these line items have historically represented ~39% of GDP, and have recently made up nearly 70% of all GDP growth. That said, we see the probabilities in favor of a material decline in non-discretionary consumption, which would be consistent with both 2001 and 2008, as shown below. This leaves non-residential and inventory investment as the primary drivers of GDP growth going forward. Given the slowdown in consumption that we foresee over the next 9 months and the current level of inventories/sales, we do not see inventories driving GDP, as businesses will need to continue to sell through current levels, especially as demand slows. Referring to non-residential investment, we can see that the current year-on-year change has historically been associated with 12/13 economic contractions, which to us indicates that it will also not have a material positive impact on GDP. We see the US economy entering a recession in Q1 2017 due to a material reduction in consumption from the top 40% of earners, who have historically followed the deterioration of lower and middle income households. Given this view, forward EPS estimates will come in materially over the next 6-9 months, which will likely result in a violent repricing of the S&P, until the next leg of quantitative easing. 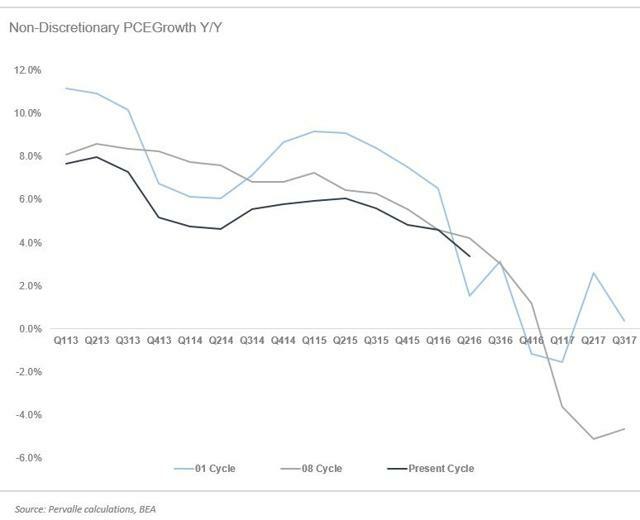 While QE4 will be short-term positive for markets, we do not see it having a stimulative effect on fundamental consumption or risk assets over the longer term, as the economy will become a prisoner of the business cycle, which the market will come to realize as economic growth turns negative. That said, the Federal Reserve is in a very precarious position, as they are attempting to hike into what we believe is a material slowdown in growth. Historically, at this stage in the margin cycle, and with similar slowdowns in retail sales, the Fed had already cut rates by 200 (2008) and 300 (2001) basis points. Today they are indicating the opposite. If we are correct about the recession in Q1 2017, the Fed will have its hands tied, as they currently have no ammunition. This will lead to a prolonged period of negative growth and result in a massive unwind of the excessive leverage in the system. We envision this future environment being very supportive for gold, which we see breaking highs on the way to $2,200 per ounce. They say to keep dancing until the music stops. Well we're not hearing anything. We have written about Germany’s recommendation that the EU not fine Spain and Portugal for their excessive deficits, as well as German Chancellor Angela Merkel’s recent call for the EU to show Italy more flexibility in terms of spending. But these are not one-off decisions, and we can expect Germany and the EU to increasingly soften their stance on austerity. Germany’s export crisis is one of the driving forces behind Berlin’s reduced focus on austerity. Following the onset of the 2008 crisis, Germany faced a dilemma: on the one hand, it was a major creditor nation. Berlin feared that southern Europe’s growing debts posed a serious risk to the stability of Germany’s banking system and to the sustainability of the eurozone. On the other hand, the eurozone is an important destination for German exports, and austerity policies – which prevented governments from adequately addressing low growth and unemployment – hurt demand for German goods. But Berlin ultimately opted to push for austerity, in the hope that it would help shield German banks from further risk-taking in southern Europe and bring fiscal health and stability to eurozone economies. German exports, it was assumed, would ultimately weather the storm. But today, Germany’s choices look different. We often point out that exports make up over 47 percent of Germany’s GDP. The country is now facing an exports crisis, with overall exports in July falling by 10 percent compared to July of 2015. Germany thought that it could continue as an export-driven powerhouse. This belief has now proved untrue. But stimulus in southern economies could help revive some demand for German goods. At the same time, despite austerity, German banks are currently facing the risk of contagion from southern Europe’s banks, which are saddled with non-performing loans and suffering due to low growth and low interest rates. As a result, many European policymakers have prioritized banks’ stability over austerity. In late August, the European Commission approved plans for a 5 billion euro ($5.6 billion) recapitalization of Portugal’s Caixa Geral de Depósitos, a state-owned entity and Portugal’s largest bank by assets. The plan includes a government injection of 2.7 billion euros which the EU has agreed not to consider state aid. European authorities are showing great flexibility on banking and budget rules for Portugal because they fear contagion from Portugal’s ailing banking system: the country conducted two banking rescues in 2014 and 2015, and its banking sector is still saddled with 33.7 billion euros worth of non-performing loans, representing 12 percent of total loans. Moreover, low interest rates have reduced the need of some southern European economies to radically cut spending by lowering their interest expenditures. For example, according to data from the European Commission, Italy’s deficit stood at 2.6 percent of GDP in 2015, down from 3 percent in 2014. However, this reduction was mostly achieved because of lower interest expenditures, not austerity policies. Italy’s interest payments declined to 4.2 percent of GDP in 2015 from 4.6 percent in 2014. The refugee crisis has also contributed to the decline of austerity politics, as the vast majority of asylum seekers arrive in two key southern European economies – Italy and Greece. According to the U.N. High Commissioner for Refugees (UNHCR), there are currently 57,000 refugees in Greece. In June, the UNHCR and partner organizations complained that they had only received half of the funding needed to implement their plans for helping refugees in Greece. While arrivals to Greece have been declining, in part due to the EU’s deal with Turkey, refugees continue heading to Italy in large numbers. Thus far in 2016, 165,409 people have arrived in Greece and 129,126 in Italy. The continuation of the refugee crisis and its disproportionate impact on southern Europe are giving the region’s governments ammunition in their negotiations over austerity. 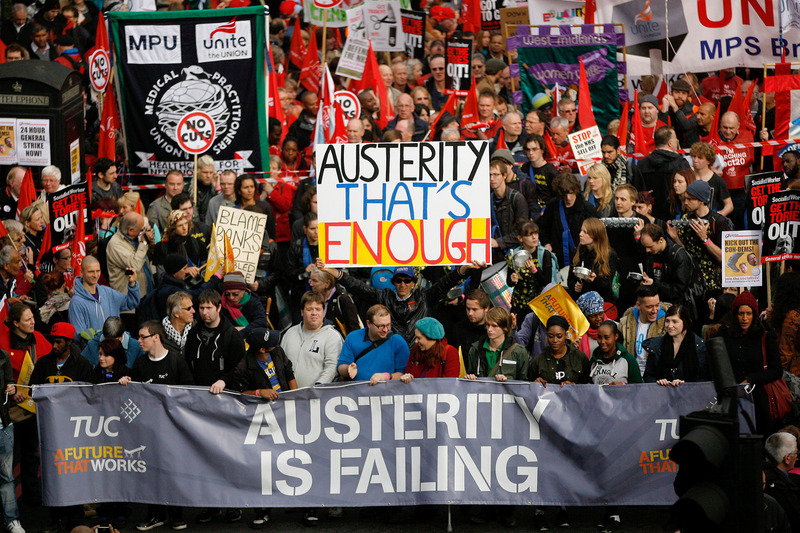 Finally, the rise of anti-establishment movements across Europe is now beginning to impact how Berlin and Brussels approach austerity. The electoral success of the Euroskeptic and anti-establishment Five Star Movement in Italy, the Portuguese government’s dependency on an anti-establishment party called the Left Bloc, and Spain’s perennial political gridlock have made European officials more cautious about fanning anti-EU sentiments. Germany’s priority is maintaining the coherence and unity of the eurozone to safeguard its access to export markets. Euroskeptic and anti-establishment parties in southern Europe pose a direct threat to the bloc’s cohesion, and Germany is thus willing to make compromises in order to reduce the influence of these forces. Southern Europe’s economies are fragile, and the decline of austerity politics does not mean that the problem of debt is going away: Italy’s gross public debt currently stands at 132.7 percent of GDP, while the European Commission puts Portugal’s gross public debt for 2016 at 126 percent of GDP and Spain’s at 100.3 percent of GDP. Haggling between governments and Brussels over budgets will continue, and some political forces in Berlin will still prefer to see spending cuts in southern Europe. But fiscal health and spending cuts in the region are gradually taking a backseat as German leaders turn their attention to the export crisis, banking stability, refugee issues and the rise of anti-establishment parties. In the long run, this may be a risky choice, and for some countries austerity could come back with a vengeance. But as Europe fragments, EU members – and Germany in particular – will become more flexible on issues like austerity as they race to address pressing crises and keep the bloc together.